My last long range flight with Lufthansa was to Capetown in 2016. On this flight, I was seated in the first row of Business class. During the flight I was wondering how it would be to fly in First Class as traveling in Business class is already luxurious. 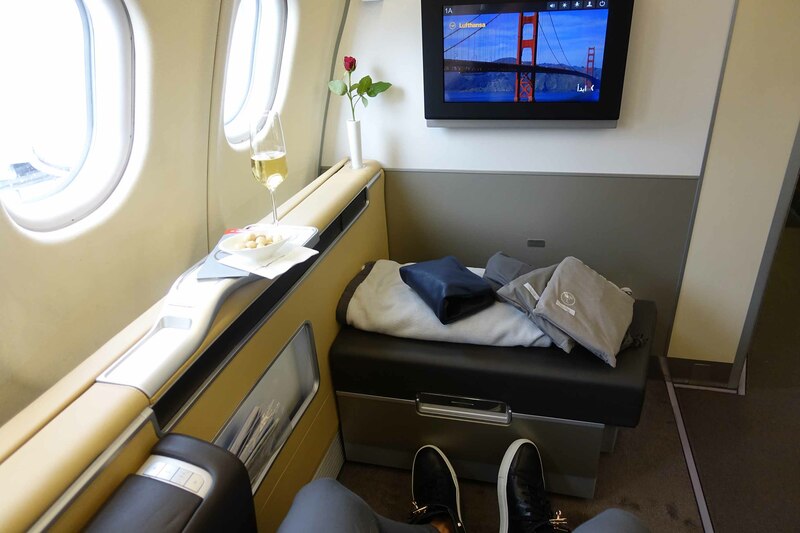 At this point, I never imagined flying in First Class already one year later. The first seven years of my aviation career I was working as a First Officer for a private jet company. I got to know the most exclusive flight service possible. That is why I was excited to see the differences between a private jet flight and a First Class flight as a passenger. You probably can imagine how excited I was to go on my flight to San Francisco. My trip started off luxurious with the limousine service of Blacklane. A comfortable Mercedes S-Class picked me up from home to take me to Berlin Tegel Airport. This service can be booked in more than 250 cities worldwide and is easy to pre-order via an application on your smartphone. In Berlin, I can recommend Blacklane‘s airport transfer in a business class car since it is faintly more expensive than a regular taxi. Their cars are clean and a friendly driver awaits you. 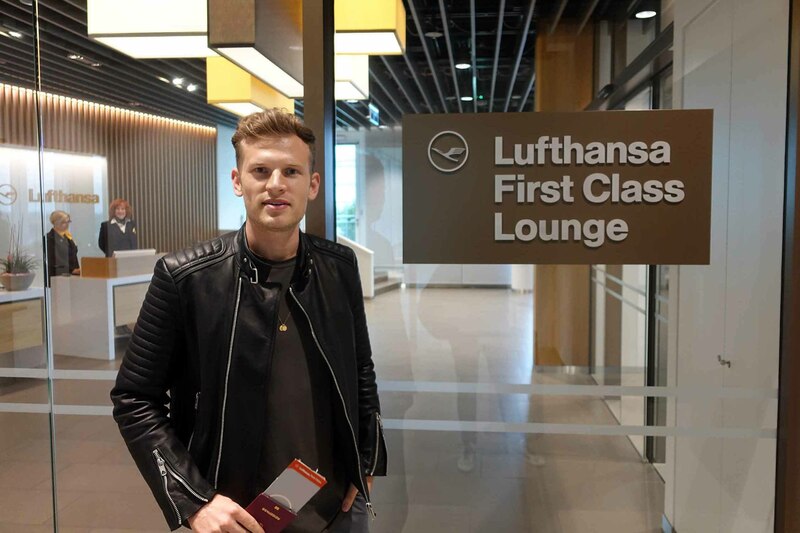 During my short layover in Munich, I visited a First Class Lounge for the very first time. The lounge was located in the new Terminal 2 satellite building and is better than any private jet lounge I have been to. 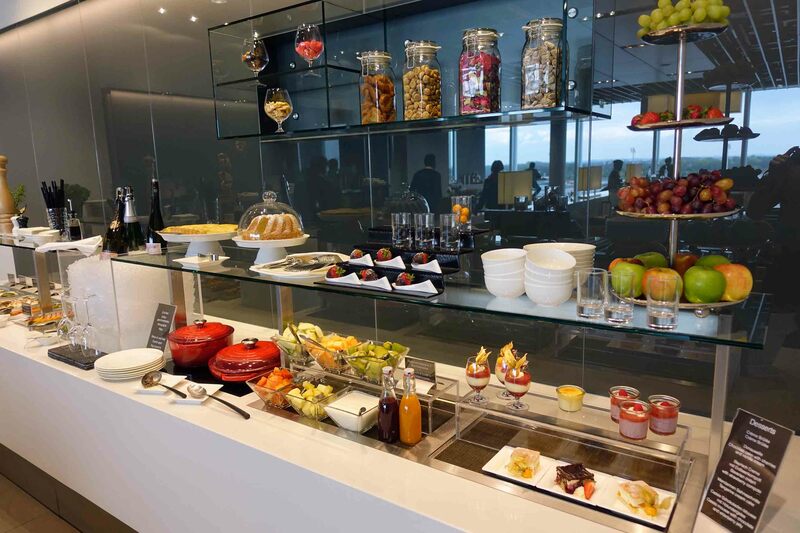 Besides a huge buffet, you could also choose from a la carte menu. While enjoying a refreshment you could watch the air traffic on the apron from cozy seating areas inside and from a terrasse outside. All kinds of facilities are provided for a demanding passenger. Compared to a Business Lounge it was much more exclusive and private. Unfortunately, I could only stay for 1,5 hours in the lounge. Try to get a connection which allows you to stay a minimum of 2 hours to enjoy the lounge the fully. My Seat was 1A on an A340-600. This is a window seat in the first row of First Class. I had so much space and storage. I really could not believe it. My seat not only offered direct aisle access but also four windows all for myself. Firstly I had to play around with all the buttons and check out the features of my own little living room above the sky. 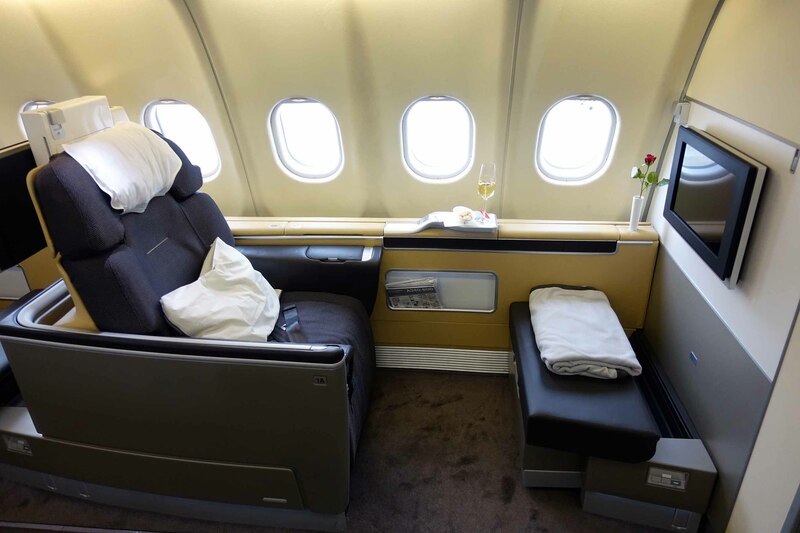 The cabin consists only of eight First Class seats creating a really private and calm atmosphere. After dinner, the flight attendant did the turndown service to my seat. In the meantime, I took a small walk through the entire airplane wearing my pyjama. I had the impression that people were staring at me. I probably looked quite silly in this grandpa style outfit. The A340-600 used to be one of the longest aircraft and offers four different booking classes. Honestly, the economy class looked tighter than before. I wish I could have invited them to the free seats up front. Returning to my seat I found a full flat 2-meter long bed with a mattress topper. A real 5-star bed in the sky. The service was exceptional and was tailored to one’s wishes. You can decide when you want to eat. There are no fixed service times. 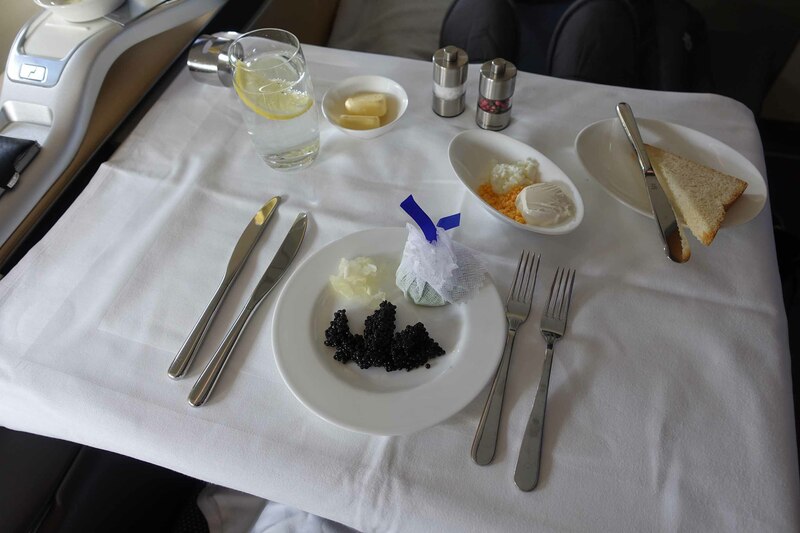 I enjoyed the full menu including the famous Lufthansa caviar service. If you get hungry during the flight you can always order something from the menu or get sweet and salty snacks from the small bar in front. The food was delicious and nicely decorated. Worth it to fly First Class? This depends solely on your personal needs. 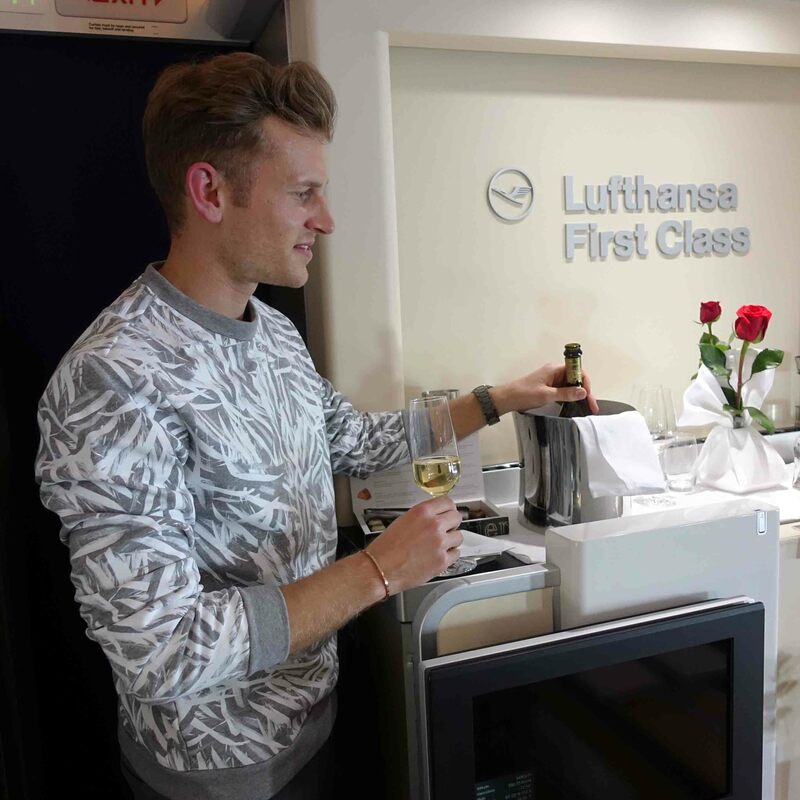 If you need the extra space and a more exclusive service then go ahead and fly First Class. 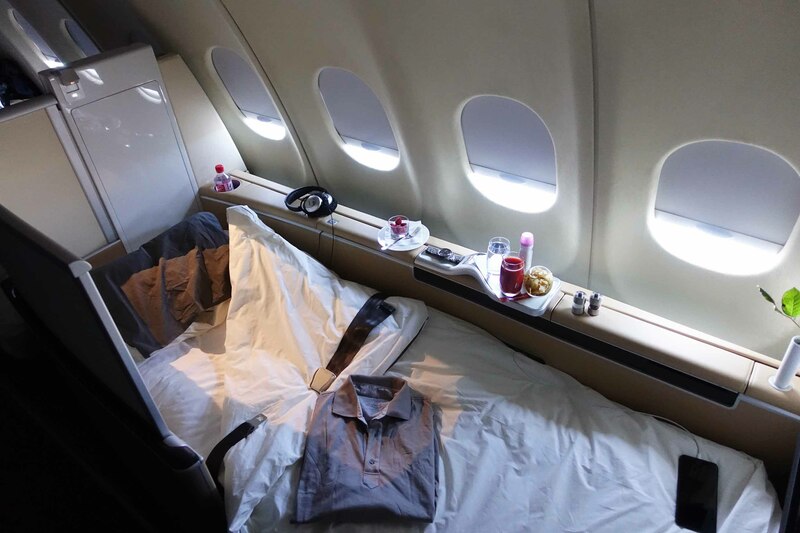 A big plus over the Business Class is the larger bed, the privacy shield, and the much smaller cabin. In the end, you do arrive at the same time as everyone else and you have to wait until everyone has boarded to be ready for take off. The price for my route was about 3000€ one way. Definitely not for everyone’s budget, but if you compare it to a private jet which costs 60,000€ the ticket is worth the price. I think if you want to allow oneself a flight in First Class then do it together with someone else at a special occasion. How can you fly First Class? You want to want to fly Economy on your next flight but do not want to spend a fortune to fly Business and First? Then register with the loyalty program of the airline or alliance you fly most of the time and start collecting miles. I usually fly with companies of the Star Alliance and I have been a Miles and More Member for ages. Since I have to travel a lot for my company and also on a private basis I reached a higher status which grants me extra benefits like the lounge access. If you are patient and start collecting miles in every possible way you end up having enough miles to book an award flight. With the Miles and More program you do not necessarily have to fly to earn miles. You can collect them by paying with your credit card or setting up a mobile. Check regularly their website for new ways to earn them and soon you will be flying First Class as well. It was truly a first class experience. Even though I did not sleep during the whole flight of 12 hours it did not last long enough to enjoy everything in detail. I love to fly as a passenger as well, but the real First Class remains up front in the cockpit. You get to your destination and you even get paid for it! 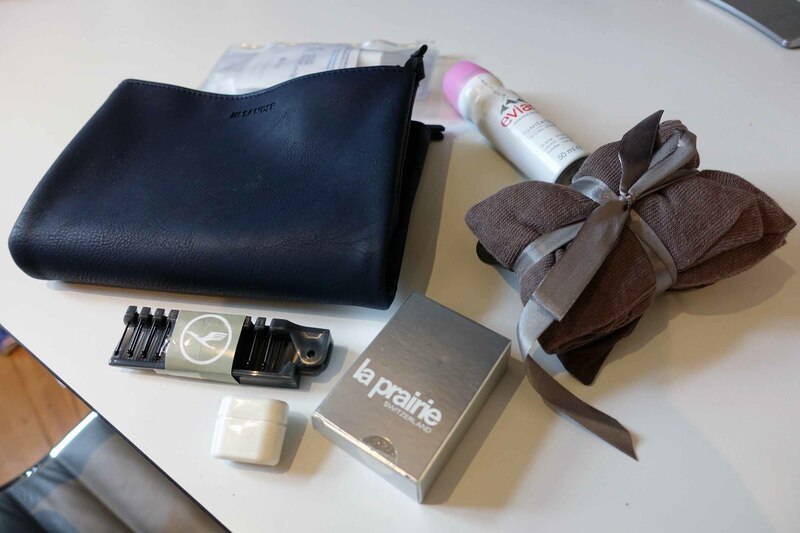 I am giving away my unused First Class amenity kit of Jil Sander with La Praire products, sleeping mask, socks, etc. Just subscribe with your email to my blog and leave a comment with your favorite airline below this article and you have the chance to win it! 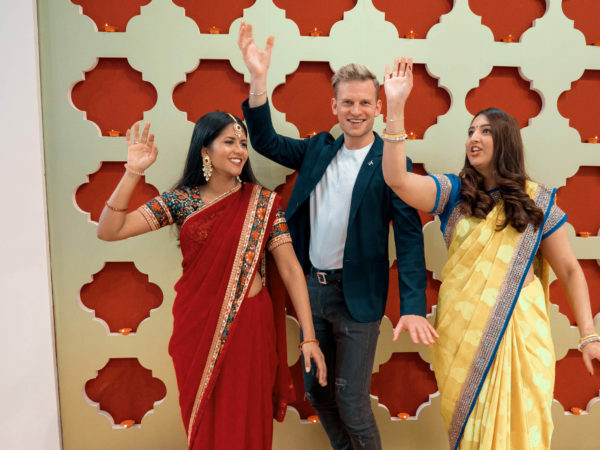 I’m Polish so definitely it’s LOT Polish airlines Greetings! thanks for your comment. Hope to see you in Europe soon! I don’t know this airline but I heard it is difficult to fly in Indonesia because of weather and terrain! Thank you for taking the time to share your most precious experiences. You are very welcome! I am excited to share that experience. 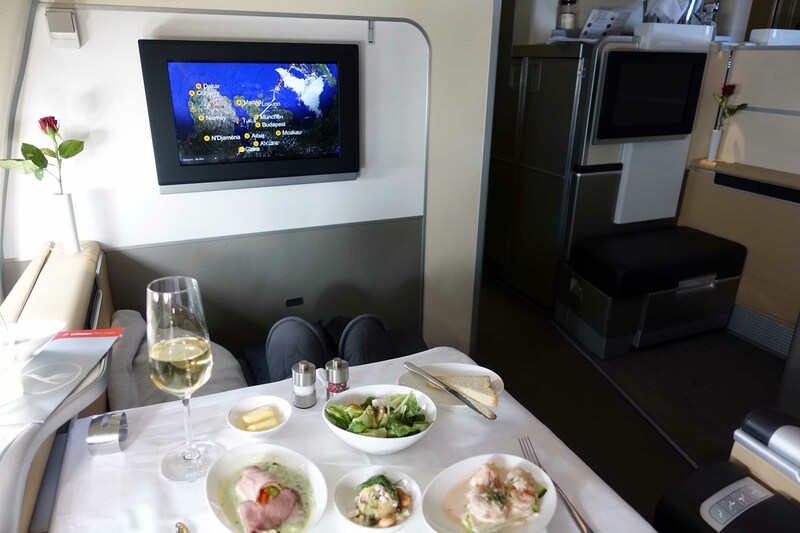 Would love to see you on a Virgin Atlantic sometime to experience the Upper Class product! thanks a lot. I would love to try out their flight experience as well. thanks for your nice comment. No you do not have to subscribe again. Thanks for your support. 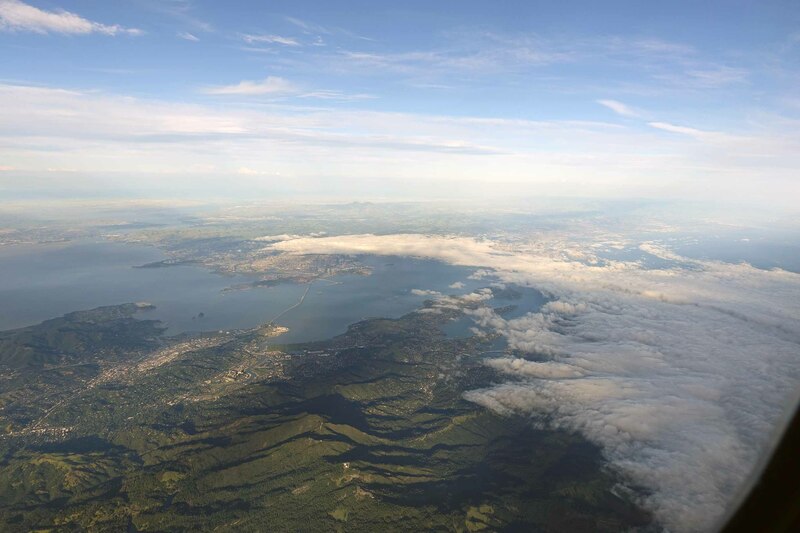 Enjoy your flights and happy landings. I hope you will enjoy your first flight ever. It will be really special! My fav airline? Very simple: Lufthansa; I can’t exactly explain why but I feel always proud & honoured to be in board of an LH aircraft. Lufthansa would be happy to hear this 🙂 They have a great fleet but they need to be faster with their innovations. Im from México, so i have flown with Aeroméxico the already dead MEXICANA COPA ( panama)AMERICAN,DELTA,to USA and with Lufthansa on my way to Europe and my fav of Course was lufthansa, it is just better. thanks for sharing your opinion. Great you prefer the german airline! It’s really nice post Patrick. And absolutely my favourite airlines is Lufthansa, though I’ve never been on Lufthansa but I see it’s really cool.. It is a great airline in all booking classes. Hope you have the chance to fly with them soon! cool ich hatte bis jetzt nur das Vergnügen auf der ITB in Emirates Sitzen Platz zu nehmen. Ja das stimmt. Airberlin finde ich auch super da sie Langstreckenflüge ab Berlin anbieten. What an amazing experience. 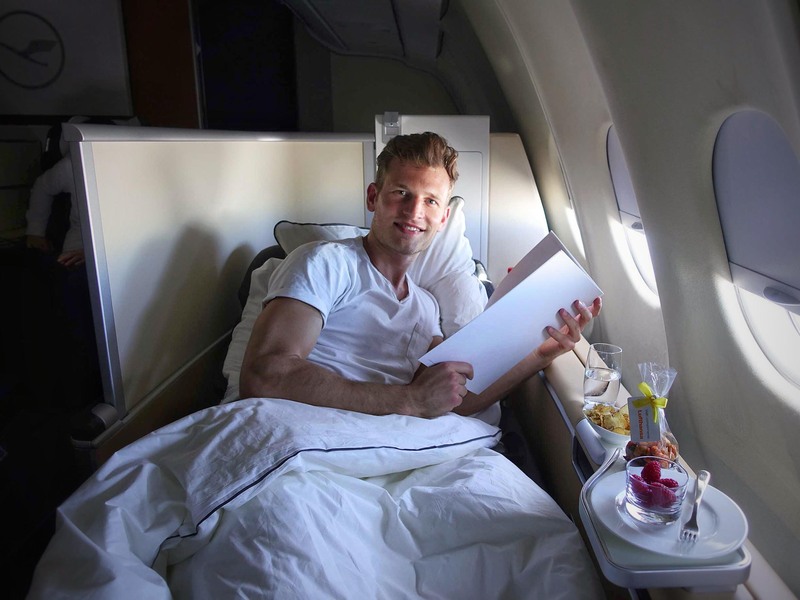 Great advice and yes really worthwhile enjoying all the other amenities that First Class offers… I guess it about the complete experience from the moment they pick you up at home, the lounge and the luxurious flight. Just wanted to ask if they provide transfer to your hotel when you arrive at your destination airport? The transfer was booked via blacklane and did not include to the first class flight. The way from San Francisco I drove with my rental car I picked up at the airpot. not every airline provides a first class. Most offer a business class since this is already a really good standard and offers enough space. But the truth is that the airlines make the money with the people flying in Business and First Class and not the people in Economy class. No the taxi ride was not included this was booked via blacklane. Etihad Airways Mein Flug FRA-AUH war einfach perfekt. 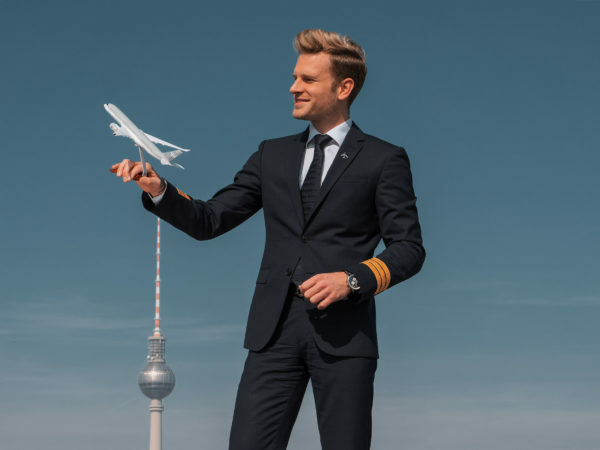 cool mit Etihad würde ich auch gerne mal fliegen! thanks for your comment and sharing your thoughts. Ich hoffe du kannst deine Ängste überwinden und das Reisen genießen. 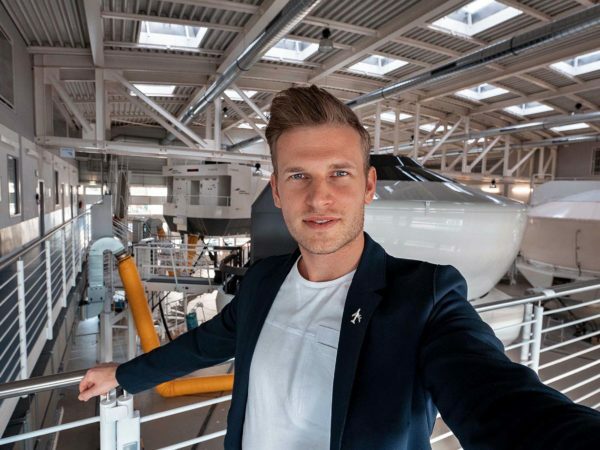 Ich fliege gerne mit Lufthansa. In der Business Class gefällt mir Air Berlin und Swiss aber besser! thanks for your nice comment and your support! I hope you have a nice first flight with Lufthansa. Many greetings to Puerto Rico! It is always an informative pleasure following your adventures! 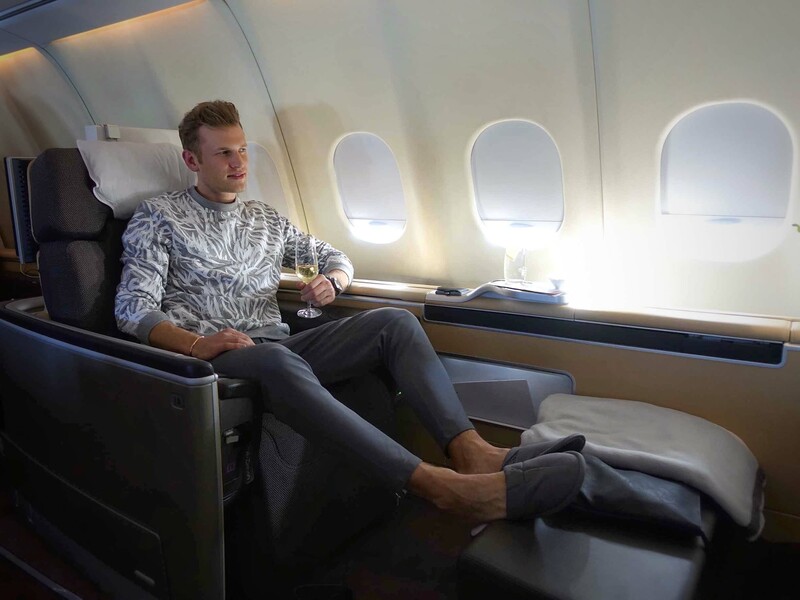 I have only ever flown First Class on Emirates but Lufthansa also looks wonderful! You are very lucky indeed although you have no doubt worked very hard for it! My favourite airlines are Cathay Pacific and Air New Zealand. Both have excellent Business Class lounges and service if you ever get the chance. Safe travels and smooth landings! Years and I have to say Emirates airlines has been super good. My favorite airline is Icelandair. They’re offering a very charming service on their flights to Iceland and it’s adorable to fly on the Boeing 757. Góð ferð! What an insightful post. Thank you for sharing your experiences and recommendations. I will be gathering all the miles i can, for sure. My favorite airlines are Lufthansa and KLM. Your blog is very amazing and thank you for sharing your experiences. My favorite airline is Garuda Indonesia. Any chance you would be prepared to give away some of your used underwear as well? 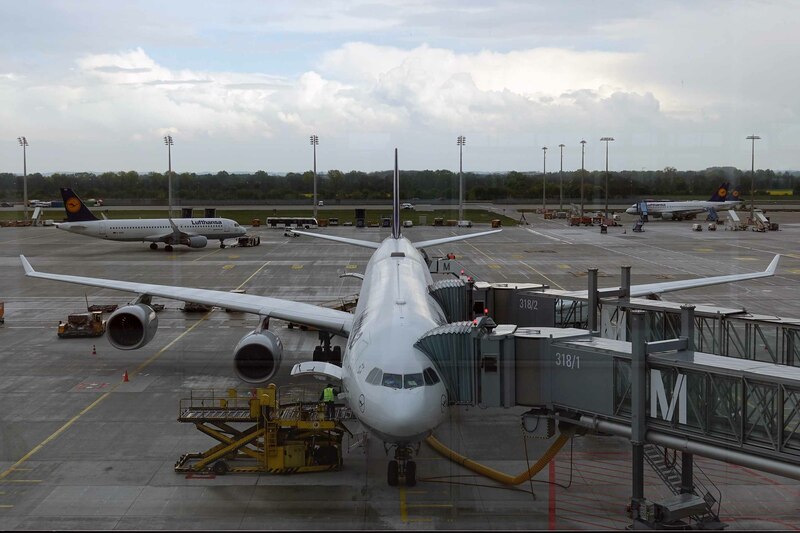 I prefers LOT Polish Airlines – simplicity is best! But the best place in aircraft is in the cockpit. I’m a pilot and this my greatest passion!! Sunrise seen from 10,000 meters.. you know. Wonderful! Nice blog entry and full of useful information. Cannot decide between LH and Emirates. Both quality at its finest. What a wonderful experience Bro. See you soon again in the sky.